One Simple Secret to Make Your Homemade Pizzas 100% Tastier! So after making pizza for many years, I start to take the little intricacies of pizza making for granted. There are hundreds of little tricks, tips, and techniques that I've learned from some great pizza makers in my career. Some are difficult to perfect dough stretching and tossing techniques, but some are very simple, common sense rules of the game. The tip I propose to you today is so simple it almost seems like I shouldn't be writing a blog post about it, but it occurs to me that not many people employ this secret - even pizza places!!! This tip does not require you to buy any special ingredients, tools, or seasonings - so if you have a premade crust from the supermarket, pizza sauce, and your favorite cheese, your all set! Need a gift for that hard to buy for person? 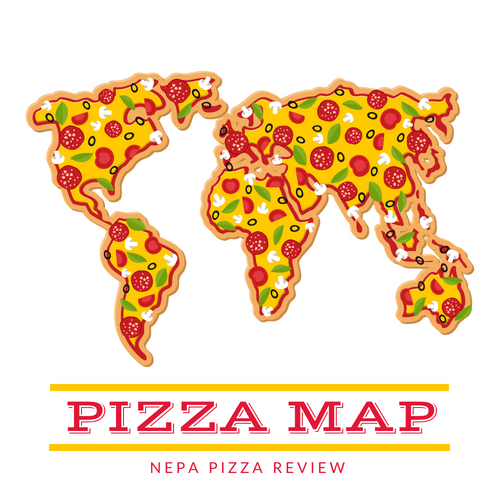 Check out the NEPA Pizza Review's Great Gift Ideas for the Pizza Lover Who is Impossible to Buy For! The secret to making a better pizza is all in the sequence that you prepare and cook the pie. Since this is only for premade crusts, primarily old forge crusts, grab a cookie sheet and place the shell in it (if you want it crispier with more flavor, simply oil the pan). Common sense tells you that the next thing you do is spread the sauce (evenly) on the shell. Now, here's the tip - rather than immediately putting the cheese on, stick the sauced shell in the preheated oven until the sauce starts to steam. Usually this takes about 3 minutes. 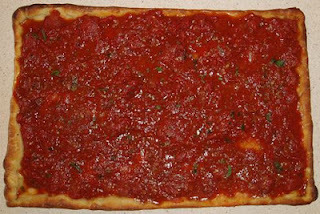 Once the sauce is steaming, pull the pizza back out, add sauce to any spots that have become dry, then spread your cheese just like you normally would. Put it back in the oven until the cheese starts to bubble and low and behold you have a pizza that has been "kicked up a notch" without adding a single ingredient or doing anything fancy. You may be saying, well what's the difference if you sauce-cheese-oven or sauce-oven-cheese-oven? There are several benefits to doing this. First, the crust gets a chance to cook more evenly because there is not a layer of cheese insulating the top of the pizza. You will find the dough will be lighter and crispier. Second, the sauce becomes more flavorful, because it is exposed to more heat and the flavors are released. When you put the cheese on the pizza and put it back in the oven, the cheese actually cooks from 2 sides because the sauce is melting it from the bottom, and the hot air from the oven are melting from the top, which creates a much better looking and tasting layer of cheese for you to enjoy. Before you call me crazy, just give it a try next time you're having a pizza night in your own kitchen. I always say, the way you prepare a pizza is just important as the ingredients themselves. So give this little trick a try, and please leave comments with your thoughts! If you like what you are reading, please follow me on facebook and/or twitter! This is great advice. When Dominic makes a square pie at Brooklyn's legendary DiFara, he does the same thing. I suspect another reason that this helps is that frequently pies are ruined by the moisture from the sauce seeping into the crust. Your sauce-bake step allows a lot of the moisture to escape the sauce before the insulating blanket of cheese is applied. So you get better texture and concentrated tomato flavor. Mangia! Well stated! I wish I thought to put your explanation into my original article. Thanks so much!